I was in a room filled with dolls. I picked out a doll. The doll looked like Jesus, but kind of slender like Jack Skellington. I wrapped the doll up and prepared to go to the temple with it. When I got to the temple. I kept repeating: "I am going to name him Isa or Jesus." The Priests took the doll and dipped it in holy water and the doll started to cough. Everyone was amazed and kind of freaked out cause it was after all a doll. We took the doll out of the water and it started to speak. 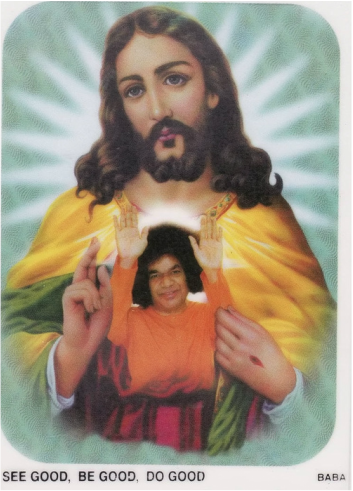 The doll told us that Sathya Sai Baba told him: "I am going to turn on your Soul" Then the doll told us some things that had transpired before we brought him to the temple. He said that the king had intended to send a beautiful robe or dress to me for his (the doll's) temple baptism. But someone was jealous and had this robe sent to a socialite. There were other things but I can't remember. I started waking up. Since this seems to be connected: a friend called me up a few days ago and said she had a dream with Sai Baba and me. She said, in the dream we were both in a cave and there was a huge boulder blocking the entrance with only a few beams of light coming through. Then suddenly Sai Baba was there and He pushed the boulder out of the way and we were able to go outside into the light and freedom. She mentioned how the ocean was extraordinarily beautiful. Last night while walking in my garage I tripped and suffered a bad fall. By Sai's grace I was only bruised but it could have been far worse. Somehow all the dreams and incidents are linked in this time frame.